The US ambassador in Kabul has written to the White House to oppose sending thousands more troops to Afghanistan. 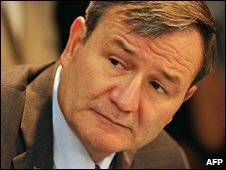 In a leaked cable, Karl Eikenberry said President Karzai's government should first prove it would tackle corruption. The message arrived amid intense debate over strategy, with President Obama yet to make a decision on troop numbers. The dramatic intervention puts the ambassador - a former military commander in Afghanistan - at odds with generals seeking reinforcements. On Wednesday, President Obama held his eighth meeting to discuss the question of whether to send tens of thousands more troops to confront the Taliban. Mr Eikenberry sent the secret cable in the past week, according to US media reports. 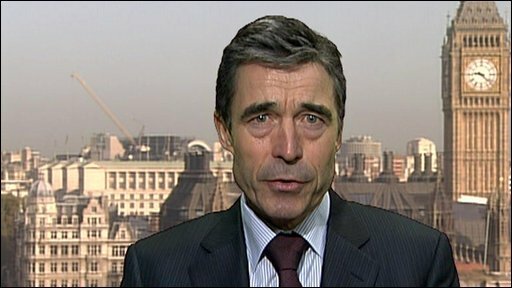 Expressing concern about corruption in Afghanistan, he said it was "not a good idea" to send substantially more soldiers, the BBC has been told. The diplomatic dispatch appears to be a dramatic and last-minute intervention by the ambassador, says BBC Washington correspondent Adam Brookes. It comes right at the end of weeks of White House deliberation over how to proceed in Afghanistan, and appears to put the ambassador at odds with the US Army, whose generals favour reinforcing and intensifying America's campaign. 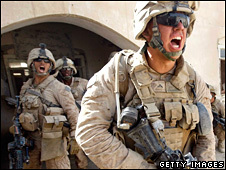 The US currently has some 68,000 troops in Afghanistan, among a coalition force of more than 100,000. Is it a bluff or could the president really send far fewer troops than expected? Sensible caution or more dithering? In weighing up the options, Mr Obama is also preoccupied with how long it would take to see results and be able to withdraw, officials said. Gen McChrystal was said to be fuming about Mr Eikenberry's intervention. But a statement issued by the White House after Wednesday afternoon's strategy meeting appeared to reflect some of the envoy's concerns. "The president believes we need to make clear to the Afghan government that our commitment is not open ended," it said. "After years of substantial investments by the American people, governance in Afghanistan must improve in a reasonable period of time." The Obama administration is also known to have concerns about the reliability of the government of President Karzai, who was last week declared winner of August's widely criticised presidential election. Speaking on a visit to the Philippines, US Secretary of State Hillary Clinton said the Obama administration had raised the issues of corruption and poor governance with President Karzai. "I think the corruption issue really goes to the heart of whether the people of Afghanistan feel that the government is on their side, is working for them," she told reporters. A spokesman for President Karzai insisted the Afghan administration was "serious" about tackling corruption. The BBC's Martin Patience in Kabul says many Afghans are lukewarm about the prospect of extra troops and want to know what they would actually do. They believe security has worsened as more troops have been sent to the country. Afghan officials insist the training of local security forces needs to be the priority - so that their troops can lead the fight against the insurgents. Western military advisers are sceptical that this can be achieved soon, our correspondent says.